First, I have to wish a very happy 30th birthday to my husband!!! I cannot believe that he is 30 already. I met him when he was 22! Where does the time go? I love you so much Troy and hope you have an amazing day! 1. Field and Flower Etsy Shop: I was sent this beautiful set of prints from the Field and Flower Etsy shop. The shop features all kinds of gorgeous prints for a baby's or child's room. I loved how this set of 4 prints went together so well. The baby's room is light green and is going to have lots of pink accents so these match really well. 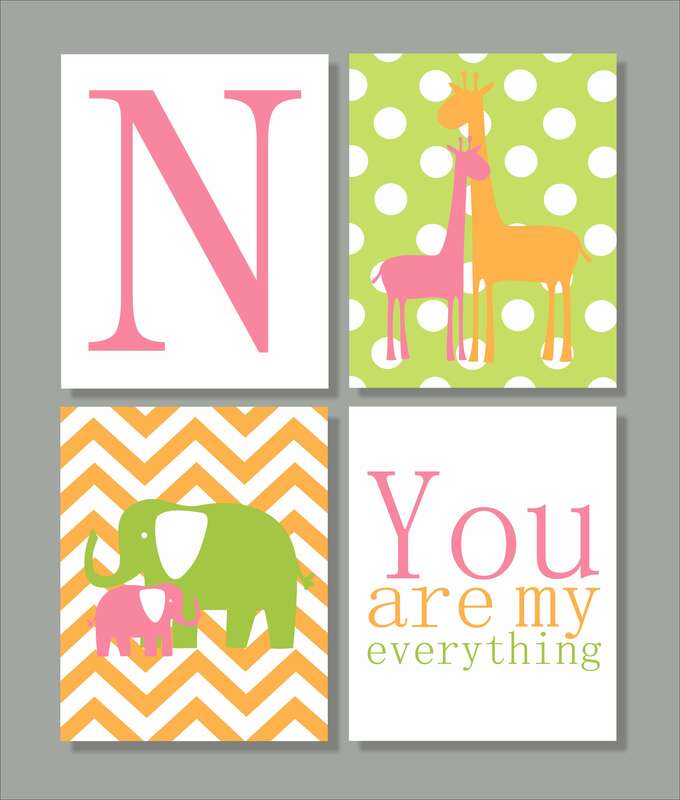 The prints can be customized by your choice of colors to match with your nursery. This set of 4 originally did not come with the elephant print but the owner Sara kindly customized it for me. I think that this print is very pretty and will be great for when the baby is a toddler as well. By the way her name starts with an A but I am not telling what it is yet (my print has an A, not an N). 2. ZeppiPrints Etsy Shop- When first finding out that I was pregnant, I went to Etsy quickly to find everything that I could about dachshunds for babies. I found tons of these dachshund prints from ZeppriPrints. I loved them! There are so many different colors and prints of this design that I love. Also, the shop has some really great nautical prints that caught my eye for if I was having a boy. These prints are $48 for a set of 3 11 x 14 prints. I just need to find some inexpensive frames to put these in and I have a really great wall hanging for the baby's room! The prints are high quality and are so cute! 3. Dezign with a Z Wall Decal- My husband is so excited about this review. I was told to choose a decal from Dezign with a Z and had fun looking through their many designs. At first, I was going to choose something for the baby's room but when I saw this decal, I knew to look no further, this would be perfect. My husband is a high school earth science teacher and of course, teaches all about the planets and space. This decal is huge and will be so perfect for his classroom. When my husband opened this package, he was so excited. It takes up most of our living room rug! He said that everything looks very realistic and is not spaced unrealistically which is great. You can choose this decal in a very small size or have it blown up very large. It looks so clear and I know that his students will love this huge decal. We actually got it on the very last day of school this year and my husband was so sad that he has to wait until August to put it up!